For Baker King, while being on TV5 may have kept it from being as big a ratings draw as the original was for GMA, it certainly was creatively successful. And maybe, TV5’s Baker King is the best local adaptation of a foreign drama series ever. Yes, ever. I did a rundown of almost every local adaptation here, minus the few that premiered in 2014 and 2015 that I didn’t watch. And I can confidently say that Baker King is the only one that found the perfect mix of great writing, great performances and faithfulness to the original. It is very hard to judge the remake of a series you watched and loved without comparing the two. I feel like doing that though can shortchange the remake and disallow you from judging it on its own merits. But I will try to do so first before going into comparisons. TV5’s Baker King featured a well-written, cohesive and tight story about love, family, friendships and revenge (plus the consequences of it). It never devolved into typical Filipino melodrama or over the top hysterics. And when they did come close, especially in its final week, they kept it at a minimum while allowing its effects to help bring the series to a satisfying conclusion. The cast had wonderful performances, most especially by its young leads in Akihiro Blanco, Inah Estrada, Shaira Mae and Mark Neumann as the title character. Any concerns over their inexperience or Mark Neumman’s Tagalog skills were easily put to rest once they finally appeared on the screen. The homegrown TV5 talents definitely showed their worth and proved they were more than capable of carrying a series as big as this. And big it was. The success of the Korean original certainly set the bar very high for this Filipino adaptation. And as a fan of the original myself, I watched the series with excitement, but also a more critical eye. Like I said earlier, I can confidently proclaim Baker King to be the best Filipino adaptation of a foreign drama yet. The biggest challenge for any adaptation or remake is to be faithful, but also allow for a fresh take while being respectful of the source material. Baker King did that. They took the source material and made it their own. Half of the series was translated and adapted from the original script, almost word for word and scene for scene. And they did it well. There was really no reason for them to change much of anything in the first 6-8 weeks of the series other than the setting and accounting for the Korean cultural aspects of the characters which they maintained. It was a little more than halfway through the series that Baker King began to get really creative. Placement of certain events were moved around. Certain details were tweaked to fit in a Filipino context. They didn’t throw away the original story, they simply took it and made it their own. They made it fit in the context of its Philippine setting with Filipino sensibilities. And good Filipino sensibilities too. Not the screaming or overdramatic hysterics typical of local drama, but the strong sense of family and loyalty. Something that is also important in Korea, but maybe even more so in the Philippines. The original story on its own was already very relatable and easily accessible for a Filipino audience. But the various Filipino touches like its focus on pan de sal or the gossiping hired help, all brought the story even closer to home. But now to the comparisons. Again, it’s hard not to compare this to the original which is still one of my favorite Korean dramas of all time. But the comparisons that follow, good or bad, don’t really matter to an audience that may not have seen any of the original at all. For a viewer going into the series with even a vague knowledge of the original, Baker King should still have been a much more engaging and tightly-written story, especially when compared to most other contemporary dramas on the other networks today. Its clear beginning, middle and end, a concept that is so basic to any story, is actually a rarity on Philippine TV. TV5’s Baker King also did an excellent job recreating some of the most memorable and emotional scenes from the original. In my Check-in Review, I provided two examples of scenes which Baker King was able to translate well. In the 2nd half of the series, I think the series was most successful in translating and adapting Master Javier’s funeral. I cried watching the original as they paid tribute to Master Pal Bong. And I cried just as much here. Most especially the moment when all the bakers came to pay their final respects and honor their mentor. It was a beautiful scene which Baker King was able to translate right. An amazing feat in and of itself. But while they absolutely handled Master Javier’s death in a way that was as emotionally powerful as the original, I feel like Baker King underwhelmed with Takgu and Sonia’s reunion. The original had Takgu’s mother Misun be taken by Manager Han’s goons. That resulted in Takgu chasing after them through dark forest. And finally, Takgu and his mother were reunited after he pleaded with the goons and appealed to their own hearts and their love for their own mothers. It was an intense and powerful scene. Here, Takgu and Sonia were reunited in the hospital as Sonia regained her eyesight. Definitely much less subdued and not as action-packed. In turn, that made the reunion a little flat. I was most disappointed because the reunion would’ve been a great opportunity for Mark Neumann and Diana Zubiri to deliver knockout performances. It was also supposed to be a huge climax considering Takgu has been searching for his mom for more than 10 years. The original’s take was one of the most iconic moments of the series. But I can see why Baker King decided on changing that scene so as to transplant that kidnapping plot to the final week in which Henry kidnaps Sonia right before Takgu’s wedding. That’s also a modification of Takgu and Manager Han’s final confrontation on the rooftop of Geosung Foods. I don’t know if budget played a part, but the final weeks of the series were greatly condensed from the original. And while those last few weeks flowed well enough, I feel like the show lost opportunities to really recreate or even create their own new powerful moments. As someone who has watched the original at least three times (twice in Korean, once through GMA’s Tagalog dub), I could definitely feel certain things were missing. While the first half of Baker King left almost no detail out of the original script, the second half sped through a few of the story arcs. The biggest one has to be Takgu getting a crash course in business when he is thrust into the President/OIC role at the company. The original was able to play up a lot of the fish out of water dynamic. A dynamic that Baker King did so well with young Takgu at the beginning of this Filipino version. That dynamic with the adult Takgu was definitely missing here. Maybe the business aspects wouldn’t appeal to the Filipino audience, but Takgu’s determination and loyalty to his father would’ve been great things to focus through such a story. Another aspect of Baker King I have to criticize is the lessening of Irene and Henry’s impact on the overall story. This should have been an opportunity for Jackie Lou Blanco and Yul Servo to deliver strong performances with big, meaty scenes and story. But I feel like they were not given as much material as they should have. Jeon In Hwa and Jung Sung Mo were absolutely powerhouses on the original. And I was looking forward to seeing Jackie Lou and Yul also get the same opportunity here. While the last week provided some of that opportunity, it would’ve been nice to see a little more. Maybe not so much more kidnapping scenes or barilan scenes, but more on the depiction of how low the two characters would go just to protect their interests. It’s possible that maybe the two were toned down for the Filipino audience. But I still feel like there was a lot of missed potential for them. This also should’ve been a great opportunity for Diana Zubiri in what is her most substantial television role yet, if I’m not mistaken. A lot of the cat and mouse games Misun (played excellently by Jeon Mi Seon) played with Insuk in the original weren’t brought over. Jeon Mi Seon had much more intriguing and emotional material. We didn’t see Sonia as much as we should have as well. I was also hoping Baker King would expand on the character of Celine (played by Malak So). Her being disregarded as a woman both in the family in the business world would’ve added a great depth too. With regards to our main couples. I think the original did a better job in developing the relationship between Majun and Yookyung than Baker King did with Michael and Eunice. 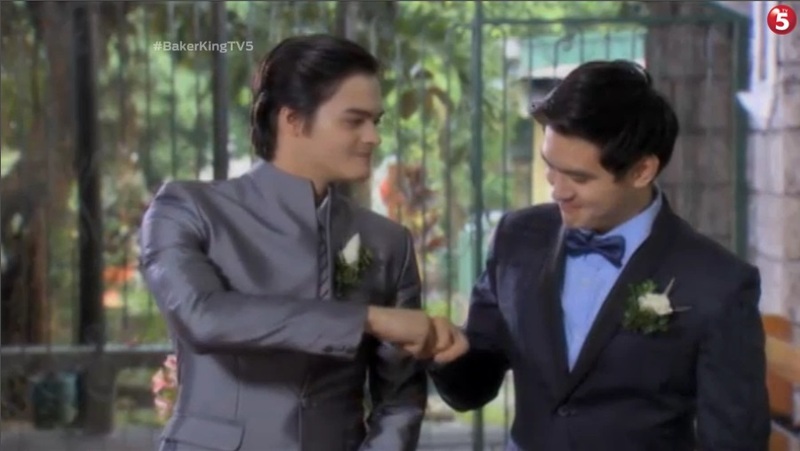 The same for the “bromance” or brotherly bond between Takgu and Michael. The pain and the forgiveness got a little more detail in the original. On the flipside, I think Baker King did a better job developing Takgu and Sunshine than the original did with Takgu and Misun. Wedding finales are Filipino staples and while I would’ve preferred Baker King not check that box off the list, they handled it well overall. Especially as a way to set up Henry and Irene’s last gasp. In that sense, Baker King‘s finale was much more finite and direct. The original was pretty open-ended. It ended with Takgu returning to the bakery with only an assumption that he and Misun finally made their relationship official. It also put Insuk in a much more desperate and lonely position than Baker King did with Irene. Insuk vowed she wasn’t done yet while Irene appears to have been resigned to the fact that she’s got a way to go to redeem herself to her family. It’s always a huge challenge for a remake or adaptation to match or top the original. While overall, the original easily tops this Filipino adaptation, that doesn’t take away the fact that Baker King was still successful. Baker King is certainly a worthy adaptation that was able to stay faithful to the original while injecting plenty of Filipino flavor into an already almost-perfect recipe. It told the universal stories of love, family and friendships. And like the original, Filipino Takgu showed audiences that instead of putting a heavy and vengeful burden on one’s heart, you should never lose hope, remain determined and live life to the fullest. Assembling a great, solid cast and pairing that with smart direction and tight writing, I believe Baker King is the strongest local Filipino adaptation of a foreign series yet. With My Fair Lady taking over for the slot on TV5’s schedule, I certainly hope these won’t be the last adaptations or just simply, daily dramas from the Kapatid network. If they can take their creative success from Baker King and do the same in future series, then it’ll only be a good thing for Philippine TV. “Editor’s” Note: This review would’ve had a lot more pretty screencaps had TV5 not suddenly geoblocked its on demand episodes, including those of Baker King, this week. 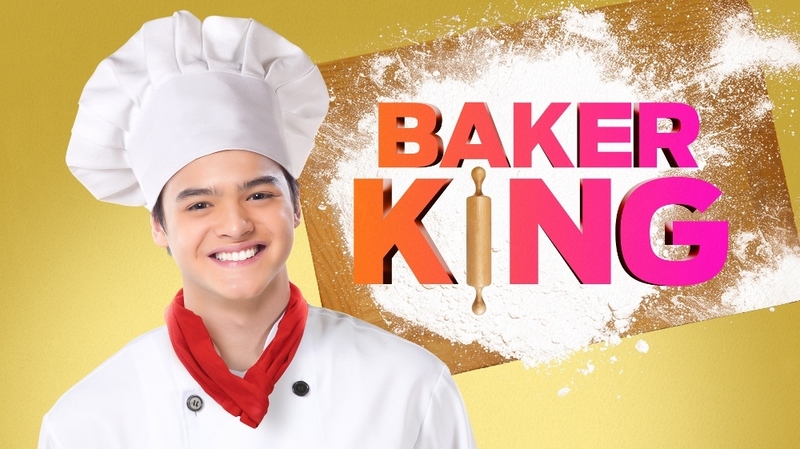 In fact, Baker King’s final week is only just airing now (week of September 21) on Kapatid TV5 here in the United States. But I watched the final episodes on TV5’s website with the hope I could write a full wrap-up and Hindsight Review as close to the Philippine finale date as possible. It’s a shame that TV5 has again decided that the way to expand its viewership and reach is to block episodes from people around the world who actually want to watch their programs, but cannot. Many times because of TV5’s own fault. (See: The Amazing Race Philippines 2) ??????? ?